After making The Corsican Brothers in 1941, Douglas Fairbanks, Jr. joined the U.S. Navy for five active, dangerous, and much-decorated years. 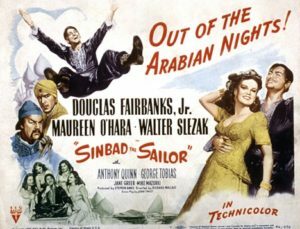 After his wartime service, returning to mere movie-making must have seemed anticlimactic, and he took his time in picking the vehicle that would re-launch his acting career, finally settling on Sinbad the Sailor. He also decided to make the movie a conscious homage to his late father, who’d died in 1939, performing a lot of his own stunts, and adopting some of Doug, Sr.’s exaggerated silent-movie gestures and mannerisms. Unfortunately, the result feels forced and affected, and Fairbanks’s performance doesn’t jibe well with the more naturalistic approach of the rest of the cast, marring an otherwise perfectly-fine fantasy swashbuckler. Strangely, though there had been a couple of animated two-reelers in the ‘30s, this film is the first live-action Sinbad movie. It’s amazing that it took until 1947 for that to happen, especially considering how many there’ve been since, but the success of A Thousand and One Nights had established the Arabian fantasy subgenre as a dependable money-maker, and from this point on they’ll come thick and fast. The story here follows the Arabian Nights convention of telling a tale within a tale, with a framing sequence in which Sinbad purports to tell his buddies in Basra the story of his hitherto-unknown eighth voyage. Unknown or not, it’s a familiar story, a treasure hunt built of standard elements, mainly useful as a setting for the lead actors to show their chops. Fairbanks was lucky in his co-stars, and it’s in their performances that this movie really shines. And so let us now once again praise Maureen O’Hara, the Queen of the Swashbucklers, who plays the clever and conniving Shireen, a Kurdish beauty with brains to spare. She’s proud and ambitious, but must somehow choose between wealth, power, and love (for Sinbad, of course!). Now further, O Best Beloved, let us praise the worthy Walter Slezak, he of the waggling eyebrows, who as the barber-surgeon Melik (among other guises), serves as the evil genie of this morality play, a corrupter and tempter so cunning and sly you can’t help but admire him, though you know he’s up to no good. As usual with Slezak, the best part of his acting is the way he shares how much fun he’s having with us, the audience. O’Hara’s intelligence lights up her performance, but Slezak’s razor wit gives his a darker edge. His Melik knows he’s a villain and will probably come to a bad end, but he accepts that as his nature and revels in it. Which brings us to the movie’s other villain, the ominous Emir of Daibul, as played by Anthony Quinn in his best rôle yet. Usually cast till now as a sidekick or second banana, here he comes into his own as a charismatic ruler of men and women, a confident commander both smart and ruthless. Quinn’s Emir—like Sinbad, Shireen, and Melik—is after Alexander the Great’s treasure on the lost island of Deryabar, and he means to have it. So do the others, of course, and between them there are plenty of temporary alliances and inevitable betrayals along the way, as well as romantic intrigue, stolen maps, virulent poison, Greek fire, and much waving around of those long, curved katar knives they all seem so fond of. Ultimately this is a fable, of course, so expect the ending to turn on a moral, before we return to Sinbad’s framing sequence where we started—Allah’s blessings be upon you!